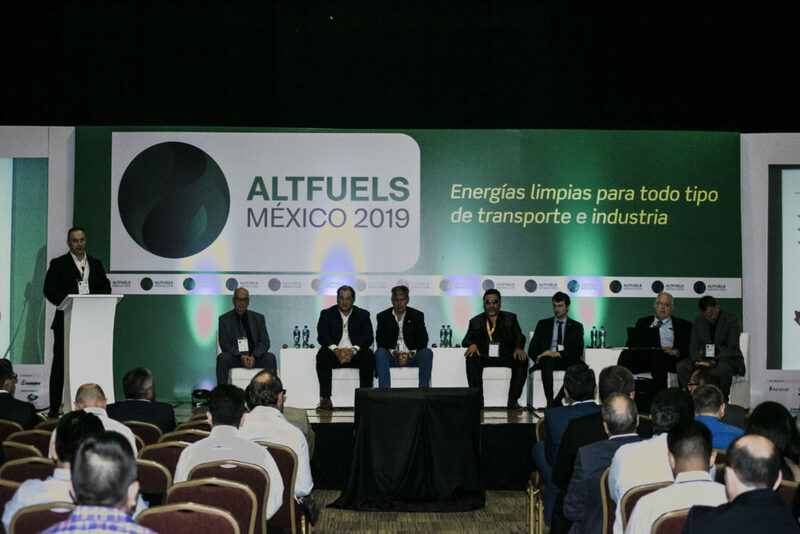 During AltFuels Mexico 2019, which take place on 11-14 March at the WTC in Mexico City, the supply of solutions for natural gas compression played a predominant role, with companies from Canada, Mexico, Italy, the United States, Argentina and Korea. Among them, Hossein Shokouhi, of Promotora Energética E3, explained that the company offers portable and fixed compressors. “A concept that we started two years ago is the all-in-one solution CNG station, where we offer the compressor, the dispensers and the panels in the same module,” he said. In addition, Giordano Gozzi, from Idromeccanica, a family company founded in the late 1960s, presented the range of natural gas compressors that can also be used with hydrogen. This system allows a complete separation of the oil and gas, thus avoiding contamination of the products, with a slow compression system of 20 to 40 cycles per minute. These compressors are connected directly to the gas pipelines and although most operate with CNG, they also have the capacity to compact biomethane. “We have a compressor that called Bustra; in all stages it is designed in the supply version to the vehicles, then it can work with the mobile storages without reducing the pressure,” he commented. The advantage it offers, he said, is that they always have the maximum possible flow, because of the pressure that mobile storage offers. On behalf of Agira, Claudio Spurkel said his company has a wide offer to compress biogas, nitrogen, hydrogen, carbon dioxide, helium, among other fuels. “Within our portfolio, the requirement of different types of gases makes us have an engineering dedicated to all the elements that we are going to compress, and adapt each machine specifically to the customer’s requirements,” he stated. Within the NGV sector, he explained, they have treatment and liquefaction plants for natural gas and biogas, with services such as transport, logistics, regasification processes or fuel supply to areas where there are no gas pipelines. Moreover, Samuel Cosme, of Hamiltec, mentioned that the company’s offer focuses on mobile filling units. “These compressors are designed with a technology where the oil does not migrate to the cylinders of the cars or the buses, allowing the injection system to have no damage in the future. This compressor will arrive in July 2019 in Toluca,” he added. This compressor consumes less energy and produces a greater amount of compressed gas, he said. In addition, he explained that they have the ability to offer customized products their clients. “If it is a fleet or if it is an industry, we can design it, because we have compressors from 100 to 900 horsepower,” he said, adding that the system allows filling an Urvan-type vehicle in less than three minutes, offer that does not yet exist in the country.